He stated, “I’m not in Nigeria; I’m at the Cambridge University and not yet home. As a PhD student, I need to get the permission of the university to travel. All I can say is that mama will be given a befitting burial; she is right now in the mortuary. “When the family announces the date for the burial, we will make it known. Her family will have to handle that because in our culture, I am to do nothing. The family takes charge and decides. At this time, I don’t do anything. I will have to wait for family instructions. So, her immediate elder brother is the one in charge. “But we thank God that we were able to recover her remains from the fire. Her body is right now in the mortuary, but she will be given a befitting burial. She was a great mother; she did her best and was well taken care of too. My mother was once kidnapped. “She was a lovely mother; one we will always remember and the mother we will always love to have at all times. Her words are left behind; we will take care of the training she imparted in us and what she did to us when she was alive. The death of my mother is a big loss; she was somebody you wouldn’t like to part with. “But death must occur; something must cause death. You cannot control that; some people die while asleep or in a plane crash. Something must cause death; it doesn’t just happen. Something must cause it. The greatest thing is that we are happy that she left a good legacy. “She usually had her prayers as a Catholic. What I was told was that she was having her prayers. She had an altar where she prayed and she lit a candle at that altar. I think that on this occasion, the candle must have ignited the window blind. She had aides; she has her own house where she stayed with a house boy, house girl and security guard. Ibrahim’s brother, Dipo, however, said their mother died as a result of family mismanagement. Dipo, who released a brief statement on the incident on Sunday, denied that the deceased was killed by a candle fire. 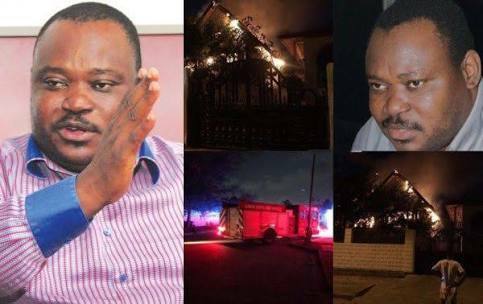 The statement read, “Dipo Jimoh (last born and the closest son to the late mother, Mrs Theresa Jimoh), who recently graduated from the Columbia University, and the MD/CEO of Barama Energy Resources, has denounced the root cause of his mother’s death as candle fire. He also denied that her remains were deposited in a morgue by the Lagos State Emergency Management Agency. When The Punch called him for further explanation, he said he would not make any further comments for now.